PIERRE, S.D. – The South Dakota Game, Fish and Parks (GFP) is seeking input on the Division of Wildlife’s land acquisitions priorities and guidelines document through April 10, 2016. Game Production Areas (GPA) and Water Access Areas (WAA) provide South Dakota residents and visitors with a myriad hunting and fishing opportunities, as well as places to enjoy wildlife and the beauty of the South Dakota landscape. GFP owns and manages 717 individual GPAs or WAAs across 57 counties in South Dakota, encompassing 282,475 acres dedicated to wildlife habitat, providing public hunting opportunities, and water access for fishing and boating. Ned Day, an artist at Sinte Gleska University, Mission, likes to share his art with others. That is why he is working with Winner High School art students. He demonstrated and had the students make seed pod rattles out of clay. After the students made a design on the rattle, Day took them back to Mission where he smoke fires the clay which will create a black shiny finish. Day has been an instructor at the art institute at Sinte Gleska for three years. He came to Mission after finishing his master of fine art degree from Fort Hays State University, Hays, Kan.
Gov. Daugaard plans to recognize a former Gregory resident, now living in Winner on his 90th birthday by proclaiming March 26 as a day in his honor. His family says their dad has lived a full life and will be elated. Born in 1926 near Erwin, SD, they say he’s always been curious about his roots after learning his father was an orphan from NYC who rode the infamous orphan train out west. According to his kids, Fr. Martin wrote the Catholic nuns at the Children’s Foundling Hospital searching for answers, but found only names on a birth certificate and the fact that he was Irish. He even traveled to the East Coast looking for relatives, but despite a life-long search, he was never able to track down any ancestors. But, anyone who knows Fr. Lyle knows he doesn’t give up easily. After high school, Martin joined the Army and fought with forces in Europe during WWII. He served under General George Patton and remembers him telling his platoon to go out and be the best citizens they could be when they got home. He never forgot that and vowed to live his life helping others. Martin first moved to Gregory in 1960 as manager of the local NW Bell Telephone Co. Later he went to work for Equitable Life and transferred to Watertown in 1966. From there he moved to Winner, then Sturgis and opened his own real estate company. But, he always yearned to pursue a dream, and that was going into the ministry. A late-comer to such a life-changing career, he was ordained a priest in 1990 at 62, the age when most retire. 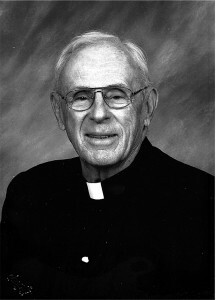 He worked as a priest in parishes at Trinity Episcopal Church in Winner, and also Mobridge, Gregory, Blair & Sidney NE. Reluctantly, he retired as a priest at age 85, but never stopped working with his “projects”. His compassion for helping others was the force behind the beginning of five different thrift stores and food pantries across South Dakota and Nebraska, including the Community Thrift Store in Winner. His most recent endeavor involved raising funds for the Wear ‘n Wares Thrift Store and Gregory Food Bank to purchase a larger building to house both units under one roof. Thanks to the generosity of local townspeople, their goal was reached in a matter of months. Fr. Martin says he’s pleased that all five thrift stores show a profit, and all proceeds go to the poor where they’re desperately needed. He recently moved to the Winner Long-Term Care Center, and noted he now plans to spread some cheer among residents there. In a couple weeks’ time, he’s proving to be a day brightener. According to nursing home personnel, the residents already love him. His family will host a birthday celebration on Sat. March 26 from 2 to 4:30 pm at the Holiday Inn Express in Winner. Friends and family are invited with a request for no gifts. Cards and well wishes may be sent to 805 E. 8th St., Room 206, Winner, SD 57580. 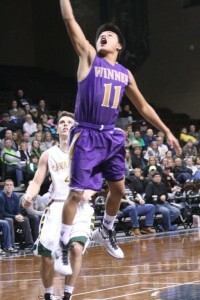 Winner High School boys basketball team placed sixth at the state Class A tournament in Rapid City this weekend. Named to the all tournament team was senior Devon Leiferman. 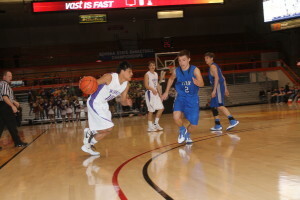 In the consolation championship game Saturday afternoon in Rapid City, Winner was defeated by Sioux Valley 56-46. In the first game of the state tournament on Thursday, the Warriors took on St. Thomas More. The Rapid City team came away with a 63-51 victory. 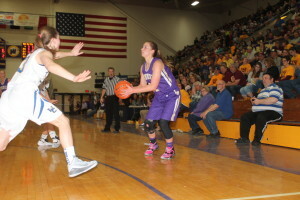 In the second game of the state tournament on Friday, Winner defeated Mt. Vernon/Plankinton 70-60. This the first time Winner has defeated Mt. Vernon/Plankinton. 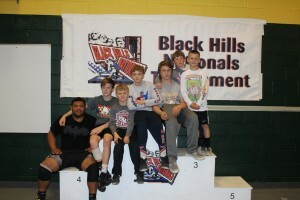 Several Winner wrestlers placed at the Black Hills Nationals in Spearfish on March 19. In the high school division, Tre’zen Doren won first and Wyatt Turnquist was 4th. Ryan Orel placed first in the senior division. The Winner/Colome club baseball team will open the season March 31 when they travel to Chamberlain. The game will start at 5:30 p.m. with junior varsity game followed by the varsity game. 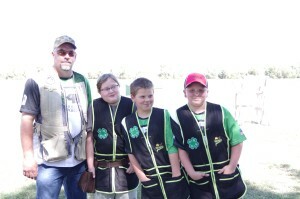 The Winner/Colome team is coached by Drew Weber and Jon Hanson. Lattrel Terkildsen of the Winner boys basketball team and Allison Cox of the Winner girls basketball team have been named to the All-Lakota Hoops boys basketball team. Terkildsen and Cox are seniors at Winner High School. Both played in the State A tournament this year. Allison Cox of the Winner Lady Warriors basketball team has been named to the Southeastern South Dakota all-conference team. Named to the second team was Bailey Volmer and named to the third team was Kylie Horstman. Taylor Hrabanek and Callie Heath of the Colome girls basketball team were named to the South Central Conference all-conference team. Mariah Kinzer was named honorable mention.